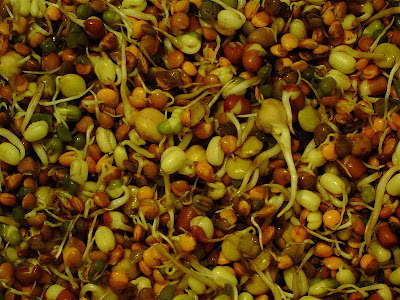 Sprouts: The sprouts can be obtained from a variety of beans and seeds.Bean Sprouts" are actually sprouted moong beans and are easy to make at home.Sprouts have outstanding nutritional value. They are rich in protein as well as vitamin A, the vitamin B complex, vitamin C and vitamin E, as well as various minerals and enzymes. 1. Wash the moong or mixed beans and soak in water for 5-6 hours or overnight. 2. Drain water thoroughly (do not rub) and wait for 5 minutes. 3. Keep in a jar and cover it with a piece of cloth (preferably muslin cloth) for 5-6 hours.Place in a refrigerator overnight. 4. Next day wash and drain and again keep it for 5-6 hours as earlier. Again place in a refrigerator overnight. By morning long sprouts are ready. Sprinkle little water on the sprouted beans and store it in the refrigerator until required. 5. It will take at least 2 days for the Moong to get sprouted.